Note:There should be no need to rotate the camshaft more than10-degrees. Using the hex cast into the camshaft rotatethe camshaft in order to install theEN 48383tools. Install the EN-48383-1 onto the rear ofthe left camshafts. 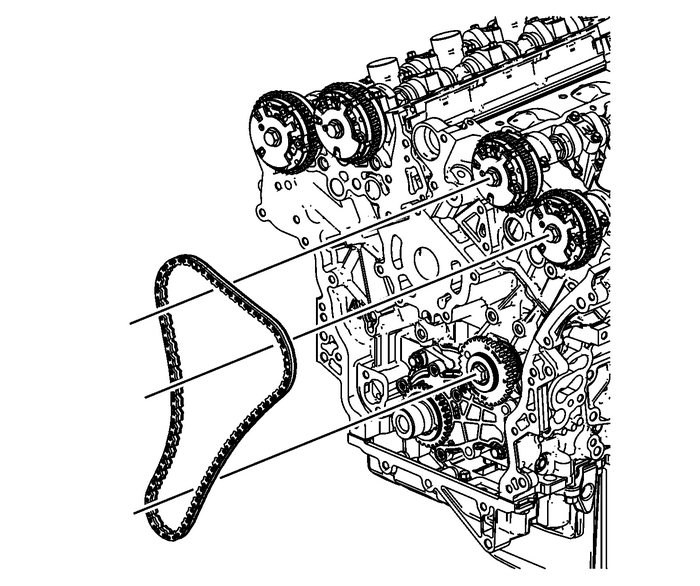 Note:All camshafts must be locked in place before installation ofany camshaft drive chains. 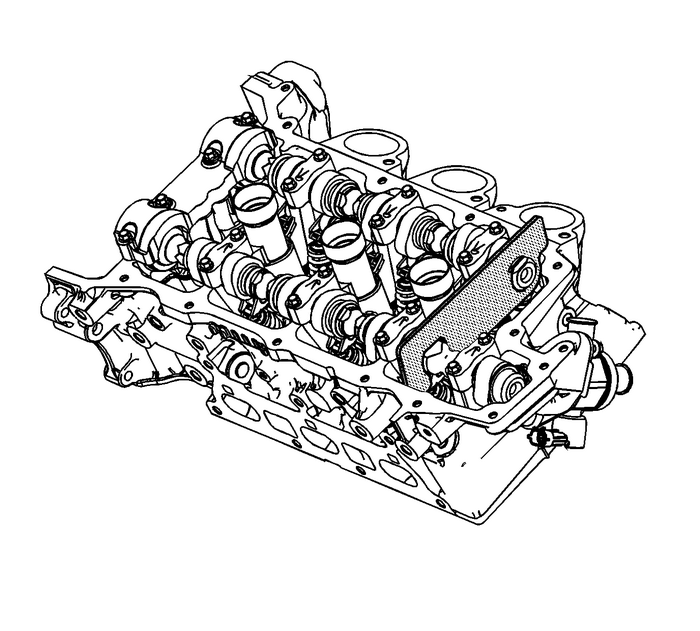 Ensure that the EN-48383-1 is fullyseated onto the camshafts. 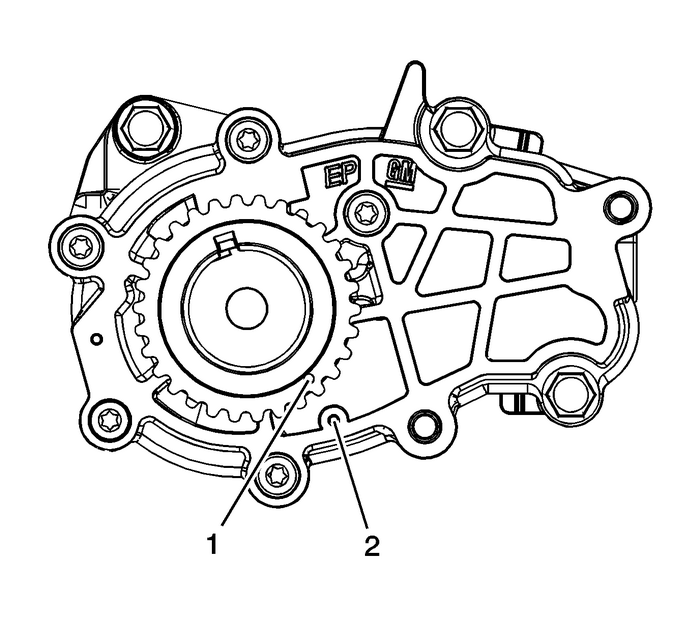 Ensure the crankshaft is in the stage one timing positionwith the crankshaft sprocket timing mark-(1) aligned tothe stage one timing mark on the oil pump cover-(2)using theEN 48589socket. Refer toTiming Chain Alignment Diagram. 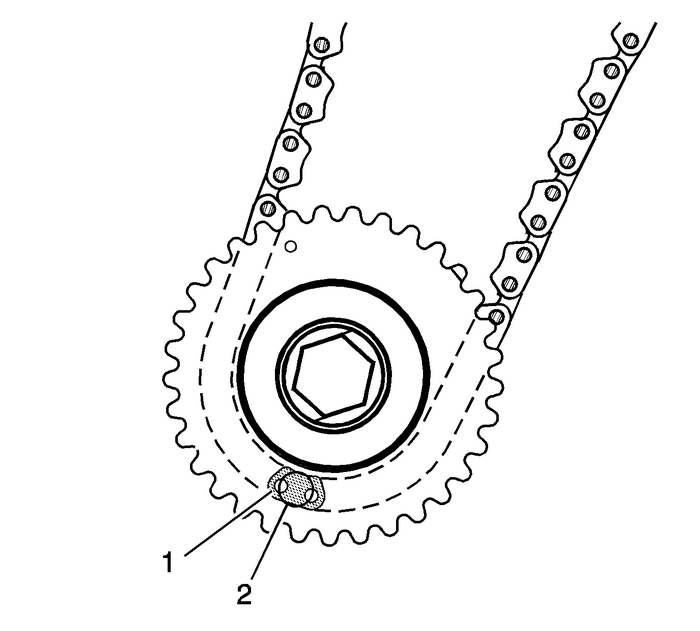 Install the left secondary camshaft drive chain. 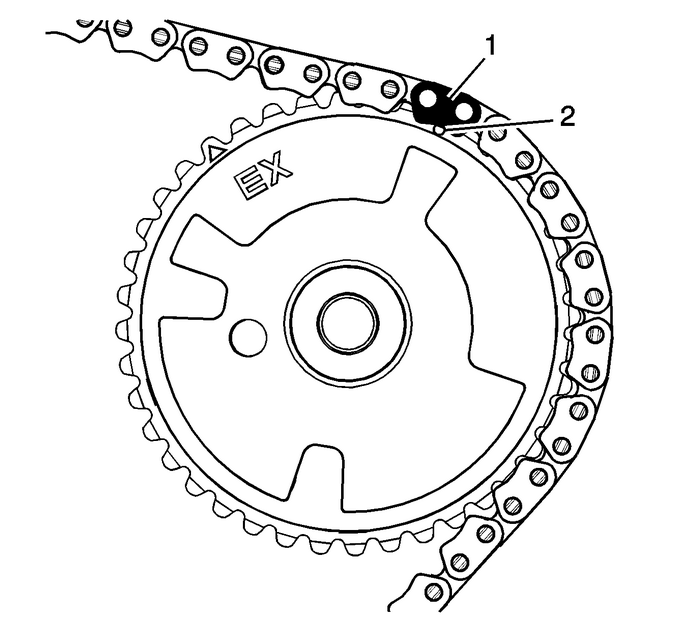 Place the left secondary camshaft drive chain around theinner sprocket of the left camshaft intermediate drive chain idlerwith the timing camshaft drive chain link-(1) aligned tothe alignment access hole-(2) made in the left camshaftintermediate drive chain idler outer sprocket. 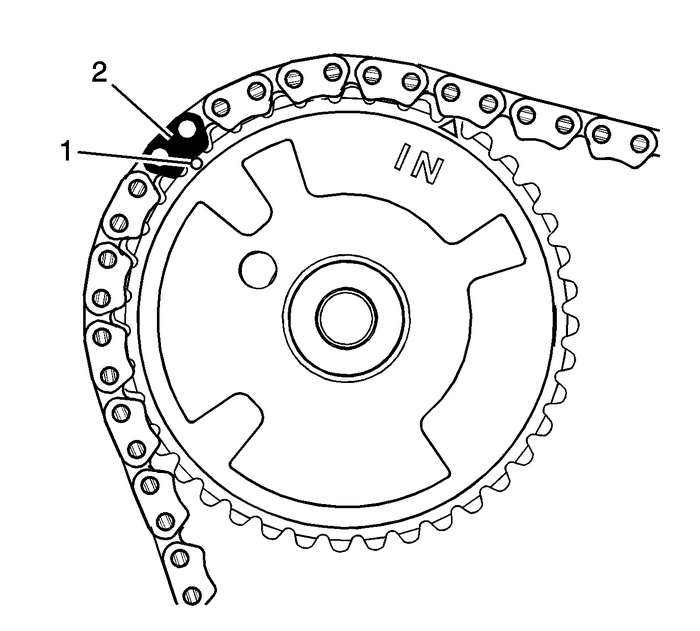 Wrap the secondary camshaft drive chain around both leftactuator drive sprockets.Ensure there are 10-links-(1) betweenthe timing camshaft drive chain links for the camshaft positionactuator sprockets. Align the left exhaust camshaft position actuator sprocketalignment circle mark-(2) with the timing camshaft drivechain link-(1). 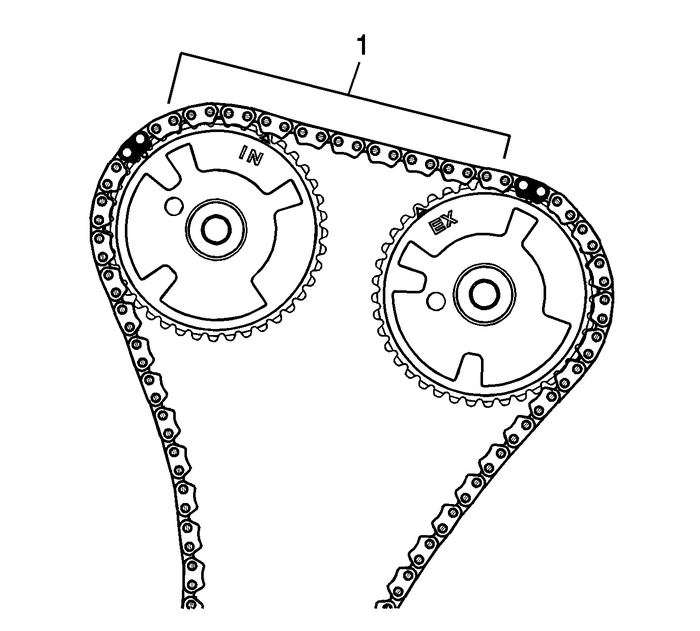 Align the left intake camshaft position actuator sprocketalignment circle mark-(1) with the timing camshaft drivechain link-(2).